Falon Co., Ltd. located in the aluminum extrusion manufacture center of Taiwan-Tainan for 20 years. We are specialized supply aluminum extrusion profiles tooling for green energy saving. 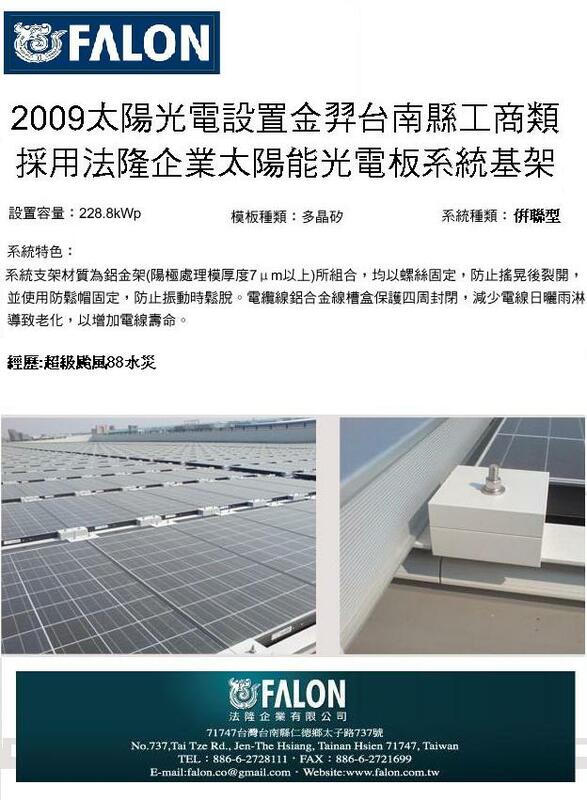 As a professional aluminum extrusion and a strict aluminum solar manufacturer in Taiwan. We support the aluminum Solar according your design drawings and your samples: aluminum extrusion profiles for solar, aluminum solar panel frame, aluminum solar bracket, aluminum solar accessories, aluminum solar PV module mounting system. We are specialized in production and sale of the aluminum accessory for solar panels and the design of solar energy system projects. Currently, we focus on producing the aluminum accessory for solar panels including professional aluminum solar panel frames, junction box, aluminum solar bracket and solar applied system. We provide aluminum molding intensive processing value-added services and so on hardware processing, surface treatment as well as assembly for the customer. The company equipment is advanced, necessary complete. The corporate management system consummates, excellent in quality, the product have been sold well in our domestic market and international market, including Japan, South-east Asia, Europe and America.